Hyperlipidemias are characterized by an increase in any or all type of lipids or lipoproteins in the blood. Fredrickson and Levy classified hyperlipoproteinemias (HLPs) according to the type of lipoprotein particles (type I-V). Familial hypertriglyceridemia (FHTG) is a relatively common (1 in 500) autosomal disorder of unknown etiology characterised by moderately elevated plasma triglycerides accompanied by elevations in cholesterol. Since the major class of lipoproteins elevated in this disorder is very low density lipoproteins (VLDL), patients with this disorder are often referred to as having type IV HLP. The elevated plasma levels of VLDL are due to increased production of VLDL, impaired catabolism of VLDL, or a combination of both. , Being more common, it is more susceptible to being undetected and can be a risk factor for complications arising due to deranged lipid profile. Type IV HLP can be triggered by alcohol intake, type 2 diabetes mellitus, hormonal therapy using steroids and estrogen, and use of certain drugs like β-blockers and diuretics. We report here a case of asymptomatic type IV HLP diagnosed incidentally due to the presence of milky white and turbid serum in a 28-year-old pregnant woman detected with gestational diabetes mellitus (GDM) in the third trimester of her pregnancy. A 28-year-old female with 8.5 months of amenorrhea was referred to our tertiary care hospital for management of GDM. Pregnancy was first confirmed at 1.5 month by urine pregnancy test. Her first and second trimesters of pregnancy were uneventful. Quickening was felt at 20 weeks. She was detected to have high blood glucose levels at 7 th month of gestation and was diagnosed to have GDM, she was then admitted for management of GDM and started on insulin therapy. The obstetric score was → G 2 P 1 L 1 A 0 . The first pregnancy was conceived naturally after 3 years of non-consanguineous marriage, and she was diagnosed with GDM at 7 th month and treated, but her pregnancy had to be terminated at 36 th week due to risk to the mother and fetus due to high blood glucose levels. Her blood glucose normalized post delivery. Menstrual history was normal with LMP-08/2/2011 and EDD-15/11/2011. There was no other significant family or medical history. A 28-year-old pregnant woman was moderately built and healthy. General physical, systemic, ophthalmic, and obstetric examinations were normal. A provisional diagnosis of G 2 P 1 L 1 with 34 weeks and 6 days of gestation with cephalic presentation in left occipito anterior (LOA) position with GDM with previous lower segment C-section (LSCS). She was started on Inj H.mixtard-20-0-14 and Inj.H.Actrapid-0-10-0. Incidentally, during the analysis of patient's blood sample, it was observed that serum was milky and turbid after centrifugation. Hence, further investigation like lipid profile and lipoprotein electrophoresis were performed to evaluate possible disorders of lipid metabolism. Serum of the patient appeared milky and turbid. Kidney and liver function tests as well as urine routine was normal. The patient's blood group was "A" positive, her hemoglobin was 11.1 g/dl, and she was HIV and HbsAg negative. On admission, her blood glucose levels were 249 mg/dl and, subsequently, on the 3 rd day of treatment, her fasting blood sugar (FBS) was 148 mg/dl, post prandial blood sugar (PPBS) was 139 mg/dl, and HbA1c was 7.2%. Lipid profile was increased with total cholesterol of 465 mg/dl, high density lipoprotein (HDL) cholesterol was 40 mg/dl, low density lipoprotein (LDL) cholesterol was 245 mg/dl, very low density lipoprotein (VLDL) was 556 mg/dl, and triglycerides were 2780 mg/dl. A lipoprotein electrophoresis was performed to reveal chylomicrons absent, beta lipoproteins 31.00% (38.6-69.4%), pre beta lipoprotein 62.50% (4.4-23.1%), and alpha protein 5.60 (22.3-53.3%). Serum uric acid was 12 mg/dl. Her mother and father also had increased triglycerides levels. Following post partum lipid profile, total cholesterol was 430 mg/dl, HDL cholesterol was 40 mg/dl, LDL cholesterol was 245 mg/dl, VLDL was 560 mg/dl, and triglycerides were 2800 mg/dl. New born baby lipid profile: Total cholesterol was 220 mg/dl, HDL cholesterol was 35 mg/dl, LDL cholesterol was 130 mg/dl, VLDL was 72 mg/dl, and triglycerides were 350 mg/dl. In this case, we noticed that serum of the patient was milky and turbid and her total cholesterol, VLDL, and triglyceride values were highly elevated that led to the provisional diagnosis of hyperlipidemia as depicted in [Table 1]. On further evaluation, the patient's systemic and ophthalmic examinations were normal. Lipoprotein electrophoresis was done to show chylomicron absent and an increase in VLDL and decrease in HDL. The diagnosis of FHTG is suggested by the triad of elevated levels of plasma triglycerides, normal/only mildly increased cholesterol levels, and reduced plasma levels of HDL. , Her father and mother had slight increased levels of triglycerides. The identification of other first degree relatives with hypertriglyceridemia is useful in diagnosis. 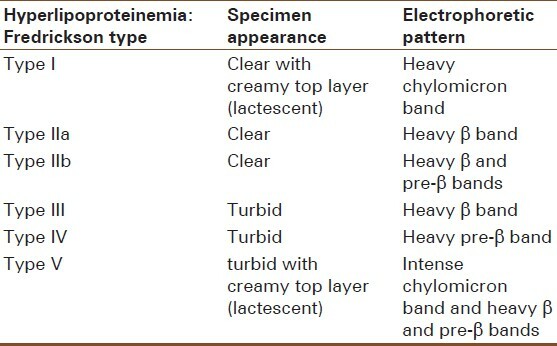 Thus, by considering all these, we can make a diagnosis of type IV HLP. Her treatment consisted of fetal monitoring and control of GDM with dietary management. She was taken up for elective caesarean section at 35 weeks to prevent any emergent conditions arising due to complications like acute pancreatitis and she delivered a male baby weighing 2.3 kg. The newborn's serum showed increased levels of total cholesterol and triglycerides. Several studies suggest that maternal cholesterol is transported from the maternal to the fetal circulation and that lipid levels of the mother are closely aligned to those of the fetus in the first 6 months of pregnancy. As a result, fetus of type IV HLP mothers may be exposed to rather high lipid levels if HLP remains undiagnosed. Serum cholesterol levels exhibit a sharp increase, and, during gestation, this becomes even more pronounced, which could add to the intricacy of the problem. About one in five children born to affected parents manifests the phenotype early in life. This case report highlights the fact that type IV HLP can be asymptomatic and diagnosed incidentally. However, increased levels of triglycerides pose a definite risk factor for premature cardiovascular morbidity. This case highlights the importance of performing a routine lipid profile during early pregnancy to rule out and lipoprotein metabolic disorders and management of such cases. The limitation of the case report was that levels of apo B 100 were not checked in the mother, lipoprotein electrophoresis was not done for the newborn, and the case was not followed for longer duration. 1. Rader DJ, Hobbs HH. Disorders of lipoprotein metabolism. In: Braunwald, Fauci, Kasper, Hauser, Longo, Jameson, editors. Harrison's Principles of Internal Medicine. 17 editions. McGraw Hill: USA; 2005. p. 2416-28. 2. Ferns G, Keti V, Griffin B. Investigation and management of hypertriglyceridaemia. J Clin Pathol 2008;61:1174-83. 3. Magnani HN, Howard AN. A quantitative method for blood lipoproteins using cellulose acetate electrophoresis. J Clin Pathol 1971;24:837-45. 4. Rifai N, Warnick GR, Remaley AT. Lipids, lipoproteins, apolipoproteins, and other cardiovascular risk factors. In: Burtis CA, Ashwood ER, Bruns DE, editors. Tietz Text Book of Clinical Chemistry and Molecular Diagnostics. 4 th Edition. WB Saunders: Philadelphia;2006. p. 903-68. 5. Basaran A. Pregnancy-induced Hyperlipoprotinemia: Review of the Literature. Reprod Sci 2009;16:5431-7. 6. Tsuang W, Navaneethan U, Ruiz L, Palascak JB, Gelrud A. Hypertriglyceridemic pancreatitis: Presentation and management. Am J Gastroenterol 2009;104:984-91. 7. Tremblay K, Ethot JM, Brisson D, Gaudet D. Etiology and risk of lactescent plasma and severe hypertriglyceridemia. J Clin Lipidol 2011;5:37-44.